This is what the public restroom on Alcatraz looks like. Hello friends! My silence of the past week is owing to my having been in San Francisco, tagging along whilst my husband covered the Game Developers Conference. I did many things and saw many sights and visited just about every museum and art gallery in the whole of downtown and had a grand time. I also learned many things, like MUNI buses will SPEED UP if you are in the street in front of them, and that Alcatraz is at the top of a thirteen-story hill, and they really work hard to terrify you with this information on the ferry ride over. I fell in love with the work of a new-to-me dead artist, Leonor Fini, and quite by accident wandered into an exhibition by Song Dong at the Yerba Buena Center for the Arts where I had my mind blown clean out of my head (and where I blurrily participated). I also ate the most delicious pumpkin curry of my whole damn life, and I even had a bit of serendipitous luck when a reader recognized me on the street and we got to have lunch together (Hi Lyndsey!). All in all, it was a delicious trip and I think San Francisco and I make very good friends, though I am happy to be back home in Boston. Or rather I will be, once the jet lag wears off. Brook Owens on March 6, 2011 at 12:38 am. 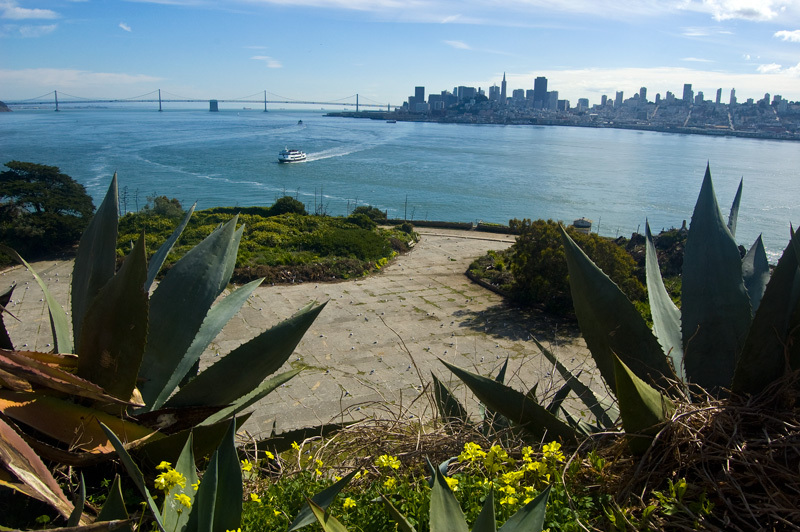 Isn’t alcatraz AMAZING? I loved it. but i also am obsessed with MSNBC “Lock up” So this was super excited to me HAHAHAHAH! Shaunta on March 6, 2011 at 1:22 am. We’re moving to Carson City this summer and I keep telling my husband–can you believe we’ll be so close to San Francisco? Just out of the blue, I’ll point it out again. San Francisco will be closer to us than the next gas station is once you leave our current remote rural Nevada town! It’ll be closer than the nearest Target is to us now. This is so exciting to me that occasionally I dream about it and then I want to tap on summer’s window and say “June, June, June” until it gets here and I get to live closer to San Francisco than I currently do to the nearest chain grocery store! cindy on March 6, 2011 at 2:20 am. One of the many charming things about MUNI! Glad you had a good time. Where were you during the bottom picture? Just gorgeous. cuppy on March 6, 2011 at 4:07 am. I went to GDC with my fiance last year & absolutely fell in love with San Francisco! Did you get a chance to go to Musee Mecanique? It’s so fantastic there & spent hours just looking around & playing all of the fun games. Plus, it’s such a great place to take lots of interesting & fun photos. Kath on March 6, 2011 at 5:01 am. Sigh… I miss San Francisco. Can’t wait to go back. Ashley on March 6, 2011 at 8:36 am. I’ve never been there, but it seems amazing. Monica on March 6, 2011 at 12:22 pm. I’m glad you had a great time! But LESLEY, what are you wearing in that photo? I would also like to be covered in yellow ruffles. Lesley on March 7, 2011 at 12:10 pm. 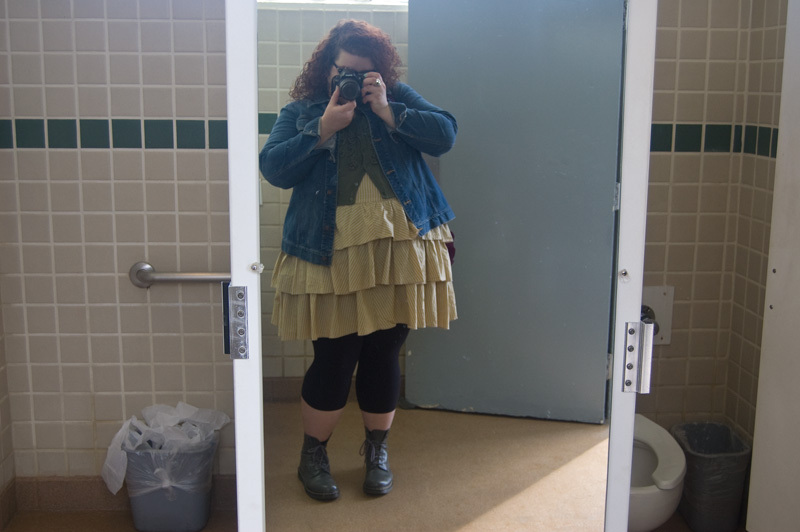 That is a dress from eShakti a couple seasons back — unfortunately it’s no longer on their site. They had a ruffle-obsessed theme going for awhile there which has since, sadly, ended. Twistie on March 6, 2011 at 12:25 pm. Well dang! Here you were in my backyard and I didn’t know it! Glad you had such a good time. thirtiesgirl on March 6, 2011 at 2:50 pm. San Francisco is my favorite city in the world and I’d give anything to be able to afford to live there. That said, though, I’ve spent my fair share of time in SF, Berkley and Oakland in my college and post-college years and found many people there to be rather unfriendly if you don’t fit in with the ‘hipster vibe’ of certain scenes. I’d still love to live there because I think SF is absolutely gorgeous, but sadly, I don’t think I’d find a supportive group of friends if I did. sandrad on March 6, 2011 at 6:54 pm. I saw “Waste Not” at the Vancouver Art Gallery. Is it not the most touching, amazing, beautiful and astonishing installation? I would love see it in all its incarnations at different galleries and spaces. Lesley on March 7, 2011 at 12:12 pm. Yes! I was mesmerized. The YBCA had several of the artist’s video installations as well, which were also incredible. Really glad I had the chance to see the exhibition. Bree on March 6, 2011 at 9:51 pm. Lesley on March 7, 2011 at 12:13 pm. They mention it briefly at the beginning, and in the guide materials, but not in the audio tour. I wound up looking up more info on my own. Fascinating stuff. Lyndsey on March 7, 2011 at 1:29 am. Yay! I loved having lunch with you, Lesley. For sure the highlight of my week. Bree, they do talk about the takeover on the tour, and all of the Indian-done graffiti is preserved. Christine on March 7, 2011 at 10:35 am. clownremover on March 7, 2011 at 2:08 pm. Btw: Where did you obtain this magical curry?? I thought I had the inside track on all Bay Area curry goodness. Next time you are in town check out Mandalay Burmese food.